Sabrina Jeffries joins forces with fellow romance authors Liz Carlyle, Julia London, and Renee Bernard in this holiday multi-author anthology set in Jeffries’ School for Heiresses series. Each author tackles what happens when Mrs. Charlotte Harris, the school’s owner, sends her young ladies home for the holidays with personally tailored lessons. In Sabrina’s “Ten Reasons to Stay,” Eliza Crenshawe’s lesson is to look before she leaps. But when she discovers her new guardian’s plans to marry her off without so much as a Season, she forgets all that. She flees–on a horse she unwittingly steals (oops!) from Colin Hunt, a newly minted earl who wants nothing more than for her to go home… or stay forever. Thanks to you wonderful readers, the book spent two weeks on the USA Today bestseller list! The new Earl of Monteith, Colin Hunt, had been in possession of Chaunceston Hall less than a day, and already trouble was afoot. Confound these English thieves to hell! Unearthing his pistol from a box, he loaded it and shoved it into the waistband of his trousers before grabbing a lit candle and hurrying into the hall. Why wasn’t some groom outside guarding the stable? Because this wasn’t India, Colin reminded himself. In his home country of twenty-eight years, the weather was so balmy that a syce could sleep across the stable doorway very comfortably. But here in England, no sane man slept outdoors in such weather. Grumbling to himself about the brutal English winter, he donned his heaviest wool surtout, lit a lantern, left the candle burning in the sconce, and headed out. The gust of icy wind that greeted him made him swear vilely again. Who would just as soon slip a knife in his back as breathe. He shuddered. No, there was nothing left for him in India, no reason to stay where the persistent memories of his wife’s slaughter at Poona could torment him. He wanted peace, and he’d hoped to find it in the sleepy English countryside. This wasn’t a brilliant start. It was only his first night at the Devon estate he’d inherited from his late unlamented grandfather, and already the local rogues were robbing him. But they were in for a surprise. Half-Indian or no, he had every right to live here, and they would soon learn that he meant to hold on to what was his, to make a home for himself in England. With that resolve beating in his breast, he slid open the stable door. At first he could see nothing, just his new Cleveland Bays sleeping in their stalls. But the faint acrid scent of a recently snuffed candle hung in the air, proving that the cloaked figure probably still lurked here somewhere. He swept his lantern in a wide arc, then came back to where his pride of purchase, a chestnut Arabian, stood wide-awake. She was saddled and ready, with a cloth sack slung over the pommel. His temper flared. So much for peace. “The hell you will,” Colin bit out and took a step forward. A hand suddenly appeared from beneath the fellow’s cloak, bearing a rather substantial flintlock pistol. “S-Stand aside,” he said as he pointed the gun at Colin. Colin’s fingers tensed on his own weapon … until he noticed that the thief’s pistol wasn’t cocked, and the barrel was an ancient rusted relic. He’d lay odds that the thing hadn’t been loaded in twenty years, much less fired. “An unloaded weapon won’t do you much good, lad,” he said dryly. The lad groaned. Without warning he hurled the pistol at Colin. As the heavy thing glanced off Colin’s brow and the boy dashed past him, Colin let out a roar and lunged after him. Catching the fellow’s hood, Colin yanked him back, then slammed him against the stable wall and pinned his arms at his sides. “Now see here, you little devil—” he began as the lad’s bared head shot up and their gazes met. The words died in Colin’s throat. Because the nearby lamp flooding the thief’s face revealed porcelain features and a tumbled-down length of thick, dark gold hair that were decidedly not male. And quite a woman, too, judging from the full mouth and long silky lashes. Not to mention the ample breasts crushed against his chest. No wonder she’d worn a cloak. No one would ever mistake her for a boy without it, breeches or no. He hated to admit it, but he did know. Despite her oaths, her speech was that of a well-bred miss. And if her tale about borrowing a horse was to be believed, she had the connections of one, too. 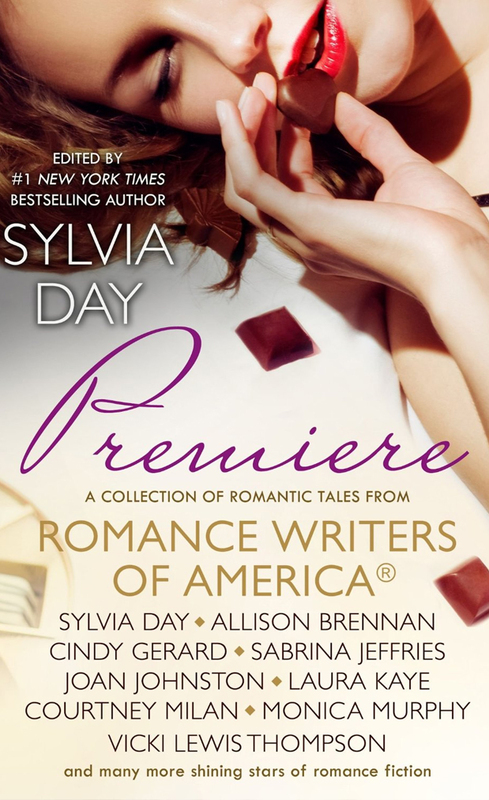 “And I’d rather not release you, so it appears we’ll be here all night,” he said, deliberately pressing his body back into her. “It appears so,” she said, but with less bravado. As he gave her his fiercest glare, she began chewing on her lower lip, and the girlish gesture made him feel like a scoundrel for bullying her. With a curse, he released her arms and shoved away from the wall. “Obviously, not that easy to steal,” she grumbled. “Not a chance.” He hurried her up the front steps. “Not until I know what you’re up to.” He led her into the house, releasing a grateful breath to be out of the infernal cold. “Hand me your cloak and gloves,” he ordered as he shut the door. With a roll of her eyes, she peeled off her gloves, then untied her cloak. But when she drew it off, the sight of what lay beneath struck the breath from him. He’d guessed her to be a girl of about sixteen. He’d guessed wrong. God help him, that was a woman’s body half-bursting out of the ridiculously tight male apparel she’d apparently “borrowed” from a man thinner than she. It was impossible not to stare at the fetching picture she made in a waistcoat half-unbuttoned to make room for her plump breasts and a pair of breeches too snug for her hips. Her unfortunate choice of a tail coat made matters worse, too, since the nipped-in waist only accentuated her curves. So did the shimmering cascade of honey-dark hair that fell to her waist unfettered, although a few lingering hair pins twinkled in the candlelight from when his grabbing her hood earlier had unloosed them. This time it wasn’t just his blood that stirred. Confound her. Why had she come along now? In the first years after his wife’s death, he’d felt nothing but grief and anger. But in recent months, especially since he’d arrived in England where his memories didn’t plague him so, his desire for feminine company—in and out of his bed—had begun to return. So the last thing he needed was a reckless runaway firing his blood. She was too much like Rashmi, his late wife. When he married again, it would be to a steady, quiet female who wanted peace as much as he. Maybe even some settled widow who wouldn’t be bothered by his mixed blood. Certainly not an impudent wench with more curves than sense. “What’s wrong?” she asked, coloring beneath his intense scrutiny. He swore under his breath. What was he thinking? She was trouble. The chit’s reason for running off was probably an elopement with some equally clod-pated idiot. Although if that were so, why hadn’t the idiot come to fetch her? It didn’t matter. Whatever her reasons, he couldn’t let her trot off to Honiton unaccompanied in the dead of winter, on horseback or otherwise. No young female with her attractions and rash tendency to land in trouble should be roaming the English countryside at midnight. The last time a woman had convinced him to let her travel without his protection, she’d ended up dead. He wasn’t about to let that happen twice. Rebellion flared in her face. Taking him by surprise, she tossed the gloves at him. As he lunged to catch them, she deftly swung the cloak to cover his head and pistol, then took off. He swore, momentarily blinded, but still managed to fight free of her cloak just as she sped past him toward the door. “Oh no you don’t,” he growled as he reached out and snagged her about the waist, then jerked her up against him. “You’re plucky—I’ll give you that.” Sneaking into a stables beneath the noses of the grooms, brandishing a relic of a pistol, attempting to disarm him with her cloak … It was more than some green lads would attempt. You may not be aware, but it was considered unseemly for a Regency gentleman to write letters to a young lady or vice-versa. Communication was supposed to go through the parents. That didn’t stop ladies from checking the mail while Papa was preoccupied, of course, so papas were particularly careful on Valentine’s Day, which was when gentlemen (and rogues) sent valentines. Thus it was with some enjoyment that I read an old blog by Two Nerdy History Girls (authors Loretta Chase and Susan Holloway Scott) about a father who intercepted a couple of “obscene” Valentines before they could horrify his daughters. I found the original letter to the editor concerning this event and was greatly amused. Today the equivalent would be dirty pics in Messenger. In my day it was obscene phone calls. 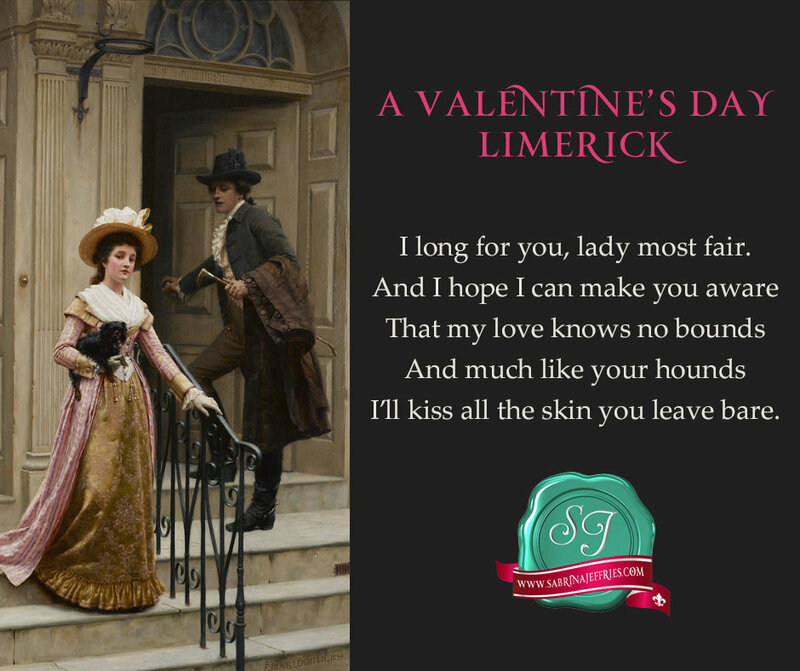 Apparently, in the regency, “depraved” valentines contained what were probably the equivalent of bawdy limericks. But I still wish I knew exactly what was in those valentines, don’t you?